Wandering with Cindy and Alan through the quiet streets of Key West the day after their wedding let them slowly unwind while we made casually intimate portraits of their post-wedding bliss. Key West is a place that often feels like time has forgotten; the colorful houses could be from anytime in the last half century, the weather is often pleasant enough to be any time of year, and the prevailing attitude of "island time" keeps everyone in a happy haze of contentment, which is perfectly suited for couples who want an ultimately low key wedding weekend. While their wedding took place at the Hyatt Key West Resort and Spa overlooking the water, their reception and the rest of their weekend festivities were at the much more intimate Ambrosia Bed and Breakfast, with balconied rooms circling the central courtyard. 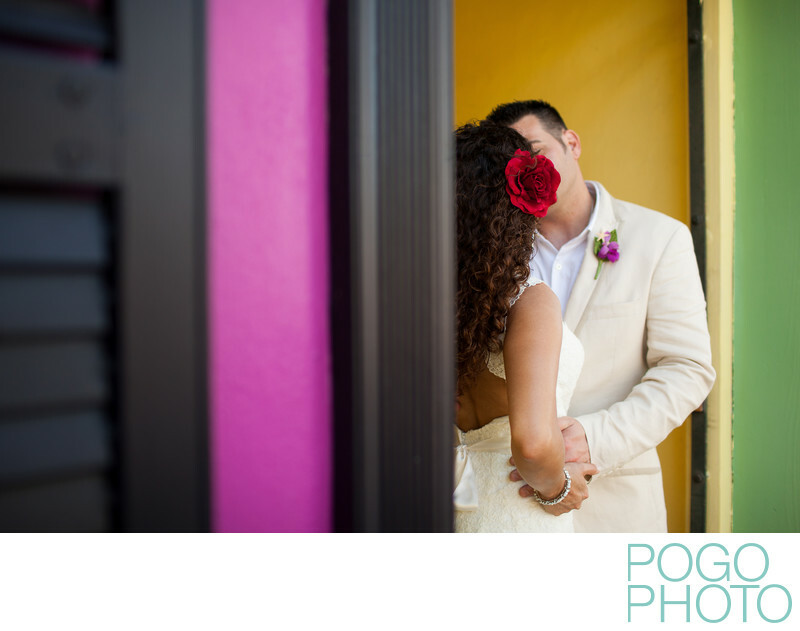 When planning where to wander during their day after session, we found new places (including a key lime pie shop where we indulged in decadent dark chocolate covered key lime pops), and looked for the pops of island color that permeate the architecture and lifestyle in this small island community. When choosing settings and compositions for images such as this one, our priority lies with the client having a good experience; in this case we didn’t try to explain what our objective with this image was, we simply set them up in good light and backed off, allowing them to enjoy each other by touching, holding, kissing, and smiling. Steve took the more obvious dead-on shot, while Em moved to the side for a sneaky, almost voyeuristic perspective. Hiding the groom’s face with the bride’s oversized hair flower contributes to the sense of mystery in this image, while the bright and bold strokes of color give a graphic quality the practically shouts “island wedding”. Choosing a shallow depth of field (see the camera metadata below) enhances the focal point of the bride and groom, and positioning the flower in the top right point using the rule of thirds draws the eye straight to where their kiss is hidden.